Life has such interesting seasons, doesn’t it? I’ve been contemplating lately the “seasons” of romance. My hubby and I are inching into a new season–and I’m totally welcoming it. My hubby just turned 40 this past weekend, and it’s a bit of a milestone that has made us look back at where we’ve come from. I’m sure it is different for all couples. HONEYMOON — That season when you don’t necessary feel like you have to look and be your best, but you’re still head over heels in ooey gooey love. You have pet names for each other that make those around you roll their eyes. You make out in public (Okay, maybe not everyone does that.) “I love you more.” “No, I love YOU more.” is a daily, sometimes hourly, part of your conversation. SETTLING IN — You get into a groove romance-wise. Habits start to form. Making out in public is rare but still there sometimes. Your “Love you more”‘s are now more once a month than daily. Maybe you start thinking about adding kids? Romance is still fun but more in a routine way than a emotional-daily-high way. WHAT’S ROMANCE AGAIN?!? — For ME, this was after kids started to arrive–mostly after kid #2 showed up. Romance is scheduled in because you know you need it, but there is really no time. It becomes WORK, a CHORE. I’m convinced this is where a lot of couples get tripped up. If romance is HARD, that must mean we aren’t in love, right? Because his stinky stocks on the floor are NOT ROMANTIC. Because if she really loved me, she’d make me nice dinners like she used to. Because if HE really loved me, he wouldn’t care about dinner and would understand just how crazy my day has been, right? Romance in this stage, for Scott and I, was hiding cheesecake and indulging together after the kids were in bed. It was hiding in a closet to sneak a passionate kiss. Romance was hard-fought for and not easy. But worth it. OH so worth it. AH! ROMANCE! I REMEMBER THAT! –This is the stage we’re finally entering. The kids are starting to get older. Our oldest ones can babysit. We’re able to go on dates more often because of this, so it isn’t a production to make it happen. We’ve found the wonder of making out in the kitchen now, much to the loud “EWWS” and “GROSS” from our children. In fact, that makes it all the more fun!! We’re a little less sleep deprived, so we’re able to put more effort into romance, and it’s feeling less like a chore every day. I know there are more seasons. I can see the hard season of empty-nesters slowly approaching–although we still have a quite a few years until we are faced with that. My hope and expectation is that we’ll face it just like we have the others. With determination to make it work. Because romance isn’t just the ooey gooey feelings. It’s the hard work. It’s making time when there isn’t. It’s sacrificing sometimes. It’s making each other a priority when 100 other things are fighting for that place. Someone asked me over the weekend if I was having a hard time with how much/fast my girls are growing up. My response, after a second, was that I was choosing to embrace the season we’re in and enjoy it. I think we can do the same with our “season” of romance. Embrace it, with all the hardships, good and bad, that come with it. Let’s Chat! 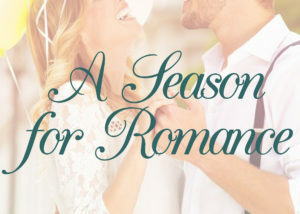 Have you had seasons in your romantic life? Examples of that “hard work” season that so easily trips us up? 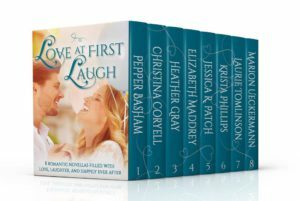 In other news, I wanted to let you know that Love at First Laugh, a 8 novella collection of romances, is available for PREORDER now for only 99 cents! It releases on March 6th and will be available to read free with kindle unlimited as well! These are 8 romances we hope will make you smile and see a few different “season” for romance along the way, from new love, to rekindled love, to love that has weathered the test of time. Krista Phillips writes inspirational romance with a dash of smiles. She believes a sprinkle of laughter (and a wee bit of chocolate) makes everything a little better! She blogs regularly about life as a wife, mother, follower of Jesus, and mother of a child with a rare congenital heart defect at www.kristaphillips.com. She is represented by Sarah Freese of WordServe Literary. Hi, I totally get this, the idea of love as seasons! My husband and I have been married for 14 years, and have 6 and 8 year old boys- life is busy! We definitely have had (and surely will have more) ‘hard work’ seasons, plus beautiful, romance times as well. Thanks for a great post, I think people need to hear more about the seasons of love, especially that love sometimes requires sacrifices!! Yup, exactly!! And sometimes love is just plain hard work!!! My hubby and I have been married over 17 years now, and have 4 girls, so yeah. Some days it’s just plain hard. But putting our romance as a priority is a must, and I think is a good model for our kids in the long run. Sometimes mommy saying no to an activity because mommy and daddy have a date scheduled is a good thing for them. And them seeing us have a quality marriage and putting in the work will (hopefully!) rub off on them when they are older and entering into their own marriage! Thanks for a thought provoking post Krista. I agree with your seasons. In June I will be married for 44 years. I have also been through the season of Empty Nest, but I was working full time and caring for my parents so I was felt blessed that my sons were on their own. Now i am in the season of Retirement. While I love my husband, their are times being together 24 / 7 is a bit much. I need space and quiet time and since I help care for my grandkids, just when I have a moment to myself, he wants to talk. The hard work of any season is love is a choice. We choose to love during the good and bad, when we have time and when we are stressed. Too everything there is a season. We tease that I will keep him, because it is too difficult at my age to train a new husband. He finally learned what makes me happy and buys me flowers and cards for specially occasions and knows I like Fanny May Mint Meltaways (this year’s Valentine’s candy). Love at First Laugh is preordered. Best wishes. After 20 years together, I believe the difficult seasons have been the ones that God has used to show me what love really means. You’re right, it’s not necessarily the ‘ooey gooey’ moments, but the tough times when we prove our love. Great post, Krista! AGREED!! Those difficult ones are definitely defining. I think my hubby and I have the strong marriage we have because of some of the really rocky spots we’ve been through. I know the seasons well. My hubby and I are going through the hard season but we make the best of it and try to remember what got us together in the first place. I believe in embracing each moment good and bad because they are all part of life’s lesson to learn and grow. Praying for you and your hubby today, Colleen!! Thirty-six years here, and firmly in that Empty Nest Stage. Yes, there are stages, and yes, embracing each and getting through it to the other side is worth it! Love is a decision — one that is made daily, and sometimes every five minutes! Hey, we’re not perfect over here. We’re not perfect over here too! We choose to embrace and laugh at our imperfections most of the time now, HAHA!! I like how you define those seasons of love based on your story. I think many people can relate. I like your stages. We’re going on 37 years of marriage. Recently empty nesters, our youngest graduated college and married last summer. Our older two are long gone. We’re moving into grand parenting 😀. I keep telling my daughter its lots of fun. We’re moving to be close to kids and grand kids who all moved away to cheaper areas. We were waiting for our youngest to finish college,and now we’re following. Now we have to be patient with each other as we go through 30 years of stuff, deciding what do keep and what to toss. Forgiveness is daily. Appreciating small things is constant. Forgiveness is daily, LOVE THAT!!! We never had kids, but did live overseas for many years, and have had our own seasons. Sometimes love is expressed best by cleaning up after the cat throws up on the rug! Yes, we ALL have seasons, regardless of if we have kids or not! And LOL on the cat puke. I totally understand these seasons of romance and life. It’s been interesting to adjust to, but we’re enjoying it. We planning our 35th anniversary trip this summer and I think it will be sweet. Just recently (as of two days ago) we have moved into the first time Grandparents season and I’m hoping it will be a sweet time! Yeah for anniversary trips!!! The one thing we’ve done that I’ve been SUPER thankful for, is to try to still go on trips, even if they are just small ones, at least once a year without kids. Grandparents take our kiddos for a week over the summer, and that did much to help our marriage through the hard parts!!!! Great post! Just celebrated 25 years of marriage. We’re getting ready for my husband to retire in a few months. I’ll be glad he won’t be getting up at 1am, but he’ll still be working 8 hours a day with more “normal” hours, getting up at 3am instead, and not having to work overtime. I feel like he’ll be more awake once this happens lol. One daughter still at home, but who works, volunteers, and takes online classes. Our son lives 10 minutes away. Sometimes I can’t wait for the empty nester stage…and going on vacation by ourselves lol. I LOLed at the “Ewws” and “Gross” from the kids at your kitchen kisses! As an older childless couple, our stages are a bit different. Between health issues and caring for elderly parents, we may be stuck in “What’s romance again?” for a while. Gotta go buy some cheesecake and sneak a few kisses still! YES! Go buy that cheesecake and sneak those kisses!!!!! Yes, marriage definitely has seasons. We are all over the place. Twenty years, two kids together. One middle school with special needs, one college. He has two from his first marriage, both are expecting their first children this summer. It is a crazy ride, we are tired, but thankful to still be on the journey together. Yes, we’ve had all-over-the-place seasons too! Congrats on being a soon-to-be Grandma!!! This is beautiful, Krista. I’m not married, but this makes me feel a little better about marriage. I always feel sad when I hear about couple splitting up, so it’s good to hear about a couple who isn’t. This is also good advice and hope for couples in their various seasons of marriage. We just celebrated our 13th wedding anniversary. The kids are in upper elementary and middle school and life seems calm and joyful. I’m not sure if we’ve ever moved out of the honeymoon stage (minus a few tension filled days during his 10 military deployments). I think it’s fun to make the kids wrinkle their noses when they catch us kissing. It’s good for them to witness a faith-filled, love-filled marriage.